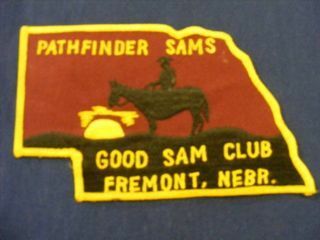 The Pathfinder Sams Chapter was organized in the Fremont area with members from Columbus, Fremont, Arlington, and Schuyler, however we now have members from Honey Creek, Iowa to Columbus, Nebraska. We meet the second Monday through Wednesday of April through October. Most campers arrive on Sunday afternoon. Our activities include table games, bean bags, touring, crafts, covered dish meals, eating out and much more. Please come join us at any of our campouts. Because of last minute schedule adjustments, it's always wise to call our president at the phone number above to verify the times and dates of each event.